Filomena Tassi, MP for Hamilton West-Ancaster-Dundas at Friday's announcement in Council Chambers. The government of Canada and province of Ontario are investing $43 million in science and engineering teaching and research labs at McMaster, the single largest government investment in laboratories and research capacity in the University’s history and part of a massive $75 million project. This joint federal-provincial investment was announced today by Filomena Tassi, MP for Hamilton West-Ancaster-Dundas, by the Hon. 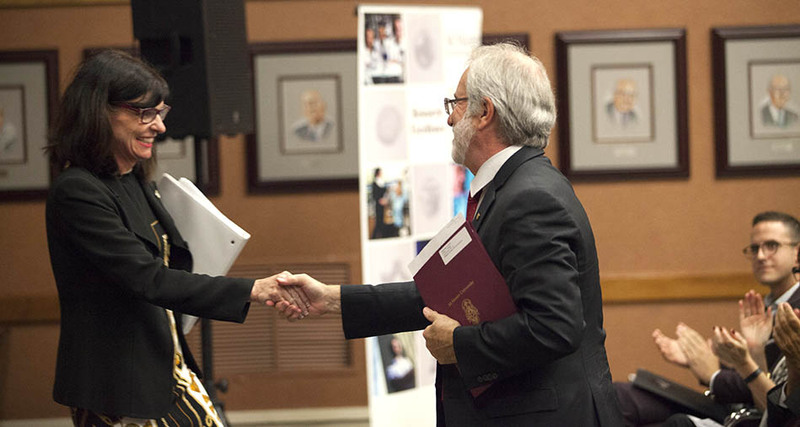 Eleanor McMahon, Minister of Tourism, Culture and Sport and MPP for Burlington, and by McMaster President Patrick Deane. The funding will support the repair and retrofit of existing labs in the Arthur Bourns Building, plus the construction of a new addition to that building. The investments also support the campus electricity and heat cogeneration (COGEN project), which enhances McMaster’s ongoing energy conservation efforts. Of the investment, $37.5 million will come from the federal government and $5.5 million from the Government of Ontario. McMaster University will provide an additional $24.3 million and Ontario’s Independent Electricity System Operator will contribute $7.6 million for a total investment of $75 million. “We are very grateful to the federal and provincial governments for this exceptional strategic investment in McMaster and Hamilton. This visionary commitment will help serve our world-class researchers and our students, and advances knowledge, enriches research and ultimately improves the lives of all Canadians,” says President Patrick Deane. “This infrastructure investment builds one of the pillars of Hamilton’s future prosperity. Our postsecondary education sector and the applied research that it produces will drive innovation today and the economy of tomorrow. McMaster’s world-class engineering and science faculty and students will now have state-of-the-art facilities in which to work and learn,” says Tassi. As a result of these investments, students, professors and researchers will work in state-of-the-art facilities advancing the country’s best research. They will collaborate in specially designed spaces that support lifelong learning and skills training. They will work in close proximity with partners to turn discoveries into products or services. In the process, they will train for—and invent—the high-value jobs of the future. Their discoveries will plant the seeds for the next generation of innovators. Ontario is making the largest investment in public infrastructure in the province’s history—about $160 billion over 12 years—which is supporting 110,000 jobs every year across Ontario with projects such as hospitals, schools, roads, bridges and transit. Since 2015, the Province has announced support for more than 475 projects that will keep people and goods moving, connect communities and improve quality of life. To learn more about infrastructure projects in your community, go to Ontario.ca/BuildON. “Our government is proud to support this important project, which will give McMaster University students access to renewed and upgraded facilities. We know that providing access to high-quality education and training facilities is critical to building the highly-skilled workforce we need to support good jobs and economic growth for today and tomorrow, and this investment will help us to do it,” McMahon said. Left to right: Bob Bratina, MP for Hamilton East-Stoney Creek, Eleanor McMahon, Minister of Tourism, Culture and Sport and MPP for Burlington, University President Patrick Deane, Filomena Tassi, MP for Hamilton West-Ancaster-Dundas, and McMaster Students Union President Justin Monaco-Barnes. Photo by Jin Lee.